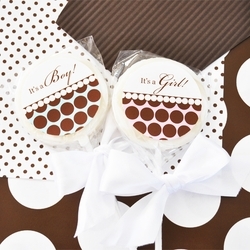 Birth Announcement Lollipops are perfect for the occasion! There's no better way to Announce the arrival of your SWEET little bundle of joy, then with Birth Announcement Lollipops! What a unique way to celebrate the birth of your little baby girl or boy! Finally, the excitement and anticipation of bringing a little one into the world is finally over. Celebrate with friends and family on this momentous occasion with a SWEET token lollipop favor announcing your exhilaration, joy and delight. These strawberry-flavored favors are a blissful treat for anyone who visits mom and baby at the hospital. Their pink or blue polka dot pattern lollipop tied with white a satin bow will also spruce up the hospital room instantly. Our Birth Announcement Lollipops are absolutely beautiful to display. Every 24 ordered arrive with a white Display Box for holding each lollipop upright in a group, ideal for keeping them neatly arrayed and showing them off along with any gifts or flowers mom receives. Easily transport the remaining lollipops home to continue sharing with baby's visitors.